Shirts With Random Triangles: Why Chip Kelly To Maryland Speculation Is The Dumbest Sports Take Out There. Why Chip Kelly To Maryland Speculation Is The Dumbest Sports Take Out There. Chip Kelly. Image via rantsports.com. It didn't take long for the rumors of Maryland's alleged plans to fire head coach Randy Edsall following the Ohio State game this weekend to go completely off the rails. With rumors of the firing comes mindless speculation of who might replace Edsall. And with speculation of who might replace Edsall comes talk of a certain Philadelphia head coach taking the job. Cue Yahoo! Sports' Pat Forde, who quickly falls into the trap of bringing up Maryland's apparel deal with Under Armour. "The school has a major benefactor in Under Armour CEO Kevin Plank, a Maryland alumnus. As Under Armour’s influence continues to spread in college sports – Wisconsin will announce Friday that it is the latest school switching from adidas to Under Armour as its outfitter – Plank could be positioned as something of an East Coast Phil Knight. In that scenario, Maryland and Plank theoretically could make a run at the coach who took Knight’s alma mater, Oregon, to its greatest heights: Chip Kelly. 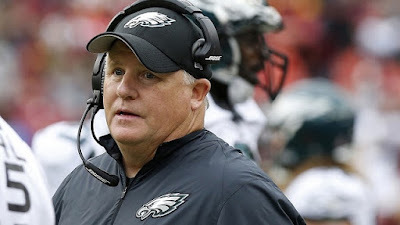 The coach of the 1-3 Philadelphia Eagles is off to a rocky start in his third season in the NFL, and there has been idle speculation that he could return to the college ranks where he thrived if the Eagles continue to flounder." Unless Kelly and Phil Knight are really on the outs with each other, his becoming head coach of Maryland is never going to happen. That would be such a coup for Under Armour to bag Kelly for their most notable school. There will most probably be a number of high profile head coaching jobs that will be open by the end of the year. If Kelly does bolt back to the college ranks, he will go to a Nike-affiliated school. Al Golden fired, is an ex-Miami coach. Texas And Nike Agree To New 15-Year Agreement. USC Fires Steve Sarkisian From Head Coaching Job. Pig Howard Is An Ex-Tennessee Vol.